Officially the Federative Republic of Brazil, it is the largest country in South America and the world's fifth largest country. 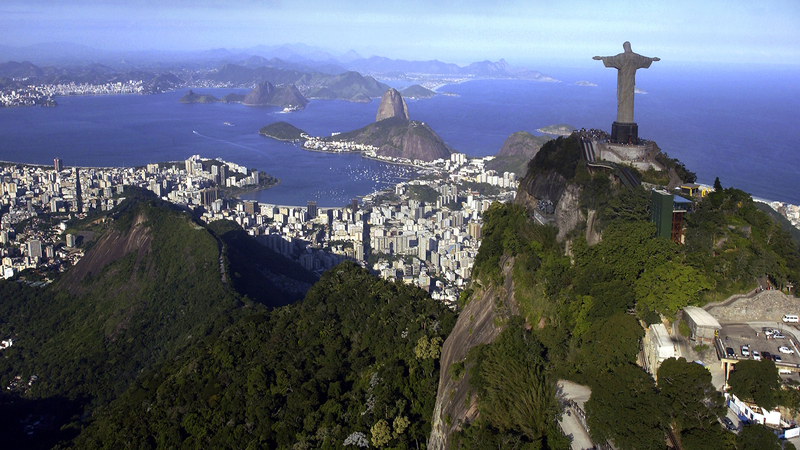 Brazil has a coastline of over 7,491 kilometers and wondrous beaches! Brazil has a dense and complex system of rivers, one of the world's most extensive, with eight major drainage basins, all of which drain into the Atlantic.The climate of Brazil comprises a wide range of weather conditions across a large area and varied topography, but most of the country is tropical. If there's one thing travelers can say about visiting Brazil, it's that the country has so much diversity that it is impossible to take it all in during one lifetime. The fifth largest country in the world, Brazil is host to some of the most amazing flavors, people, and geography on the planet. From the Brazilian wines, to the Brazilian beaches, the Amazon rain forest, the unspoiled islands of Illha do Mel or Illha Grande, the mountains and the plains, or the coffee, there is virtually no limit to the amazing sights, sounds, smells, and tastes a traveler can experience when visiting this South American country. The official language is Portuguese, although Spanish speakers can generally get by in a pinch. English is fairly rare outside of the main tourist traps, but as a general rule of thumb unless you are absolutely a first-timer, you won't have any difficulties getting around in the country. Public transportation is generally considered to be the optimal way of doing things, as driving a car in this country can lead to an early heart attack. When in doubt, rent a cab, take a bus, a boat, a train, or a plane. The cuisine within Brazil is as famous as its beaches or its wine and coffee. However, as with any country offering street vendors as the local version of fast food, make sure to only eat at places which look clean, serve the food piping hot, and cover their dishes. Bottled water is a must especially if you're on a quick visit. Regardless if you come here by cruise or by plane, you can either stay in one of the various resorts in places like Brasilia or Fortaleza, or if you want to head up the river to stay in Manaus, the capital of the Amazonas State, you can find virtually every type of accommodation to suit every type of traveler. See an error? Want to suggest something special? Feel free to take part in a discussion on Brazil. Currently there are no places in Brazil. Currently there are no articles about Brazil. Currently there are no trip reports about Brazil. Currently there are no photo of Brazil. Currently there are no videos of Brazil.